An unprotected underground storage tanks life expectancy is 15 to 20 years of age. Just like the roof on your house, underground and above ground fuel storage tanks eventually will wear out and need to be replaced. Though the State of New York does not regulate residential underground storage tanks under 1001 gallons, nor does the State of New Jersey regulate ANY residential tank, the decommissioning/replacement of a tank, just like new siding or a roof, is something for which the homeowner should eventually budget. When taking action on your tank, there are solutions. Abandoning a tank is the least obstructive means of decommissioning a tank. Typically soils located above the underground tank are hand excavated. The size of the excavation is usually 50” x 50”. After gaining access to the top of the tank it is cut large enough to have a field technician fit inside of the tank. The tank would then be emptied and all the contents from the tank would then be either transferred into a new tank on site, or be disposed of at a licensed waste disposal facility. After the tank has been properly cleaned the tank is then filled with gravel. After the tanks interior if filled, the soils unearthed would be placed back from which they were. Tank abandonment will minimize the restoration of the property versus tank removal. A qualified tank removal contractor, like Mike Hoensch Tank Company, will make sure the necessary permits are obtained (if required) and all procedures are followed in compliance with state and local regulations. The tank is removed and disposed of properly. The tank void is then filled with clean fill and brought back to grade. Mike Hoensch Tank Company offers both underground and aboveground storage tank solutions providing our home with warranted tanks for today and tomorrow. Typically soils located above the underground tank are hand excavated. The size of the excavation is usually 50” x 50”. The tank would then be emptied and all the contents from the tank would then be either transferred into a new tank on site, or be disposed of at a licensed waste disposal facility. After the tank has been properly cleaned and inspected the tank is then filled with an inert material. Mike Hoensch Tank Company Inc. recommends pea gravel. The placement of this material will not change if water interfaces with it as it would with sand. After the tanks interior if filled, the soils unearthed would be placed back from which they were. Tank abandonment will minimize the restoration of the property versus tank removal. 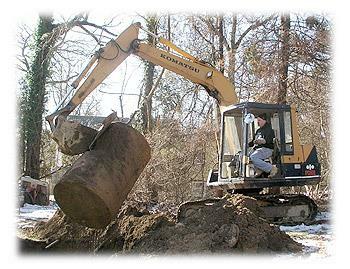 Typically machinery is utilized to conduct an underground tank removal. The size of the excavation normally extends 2 feet past each direction of the size of the tank. A 550-gallon tank (typical for most residences) measures 48” in diameter and is 5’5” Long. After gaining access to the top of the tank the tank would then be emptied and all the contents from the tank would then be either transferred into a new tank on site, or be disposed of at a licensed waste disposal facility. Prior to the tank being removed the local inspector will look at the interior of the tank as to inspect the tank for any possible leaks, and to insure the tank has been properly cleaned. After the tank has been properly cleaned and the inspector has completed the inspection, the tanks void is then filled with clean fill. Typically above ground storage tanks are either placed inside or outside of the home. The tank would then be emptied and all the contents from the tank would then be either transferred into a new tank on site, or be disposed of at a licensed waste disposal facility. After the tank has been properly cleaned and the inspector has completed the inspection, the holes in the building from either the fill, vent, or oil lines would then also be removed and the holes would be patched. Oil tank installation consists of either above ground, or under ground tanks. Mike Hoensch Tank Company offers only state of the art tanks with the newest technology. All of our tanks carry a 2,10 or 20-year warrantee and are single or double walled. Our aboveground tanks range from 120 to 400 gallons and are horizontal or vertical. These tanks can be installed either inside or outside of the home. They can also be manifold together. Our installations are second to none, using a whistle vent alarm; site gauge to show the oil capacity and all piping is painted for aesthetics and to minimize rusting. We never use compression fittings, only flared for the safest and best results. The fill & vent lines are 2 inches in diameter, providing the proper ventilation and eliminating any pressure build up during deliveries which could possibly damage the tank. All tanks and associated piping are air tested prior to installation. Our installer is trained to install oil tanks above standard building code requirements whether the township requires an inspection or not. Much time and effort is placed into our installation to assure a satisfied customer for years to come. In the event that the tank being decommissioned is found to be leaking, the person discovering the leak must notify a hotline of such an incident. When such a call is placed to either NJ DEP (New Jersey Department of Environmental Protection), or NY DEC (New York Department of Environmental Conservation), a case number is issued to the site. In order to remove a case number, remedial efforts and or an investigation is required. A report must be filed indicating that soil samples and possibly groundwater samples are below actionable levels. The NJ DEP or NY DEC would then prepare a letter indicating that no further action is required. Our Tank Installation / Tank Removal / Site Remediation crew is trained to know the new ways of the technology made available to us. Field technicians have a commitment of excellence as to the way to care about what they do best. Our office staff realizes the importance of conducting themselves in a professional Friendly manner. We are available to you 24 hours a day; seven day’s a week. Please contact us for a no obligation free estimate.